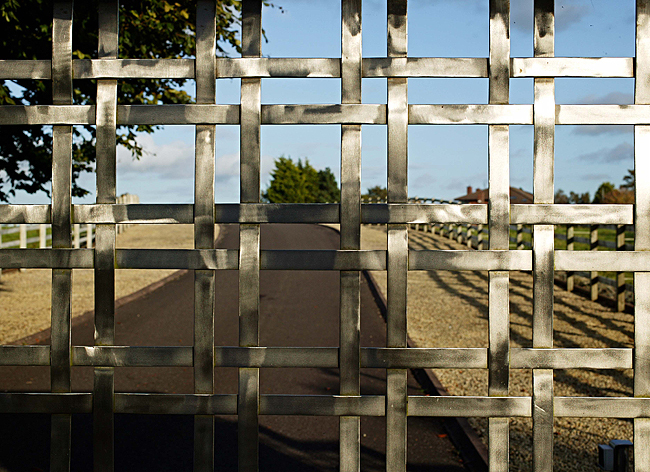 Within each frame are numerous stainless flat bars that have been painstakingly interwoven vertically and horizontally by master craftsman, Andrew Clarke of Rock Forging Ltd. When the gates are closed, this pattern appears to run through from end to end within the cedar frame. The play of reflecting light and shadow on the gates from day to day and season to season in quit intriguing. At times they shimmer blindingly while on other occasions they glow warmly in the evening sunlight. The vehicular gates are separated from the pedestrian gates by two tall, wide and imposing red brick piers capped in granite stone. These step down and out in the form of raised flowerbeds that welcome the visitor. The interwoven stainless steel patchwork and cedar surround is again repeated here with an intricate fixed element that also steps down and back to meet the pedestrian gates at both ends which are framed by two lower piers. What emerges through the synthesis and composition of materials is an imposing and protective entrance yet one, that by way of colour and transparency is also inviting.